A tow truck prepares to remove the damaged car from the side of the road | Photo: Lake and McHenry County Scanner. A 38-year-old man was injured after he illegally passed a vehicle, lost control, and rolled his car over, striking the railroad tracks in Round Lake Tuesday evening. The Lake County Sheriff’s Office and the Greater Round Lake Fire Protection District responded at 4:30 p.m. on Tuesday to Route 134 east of Fairfield Road in Round Lake for a single-vehicle crash. Lake County Sheriff Sgt. 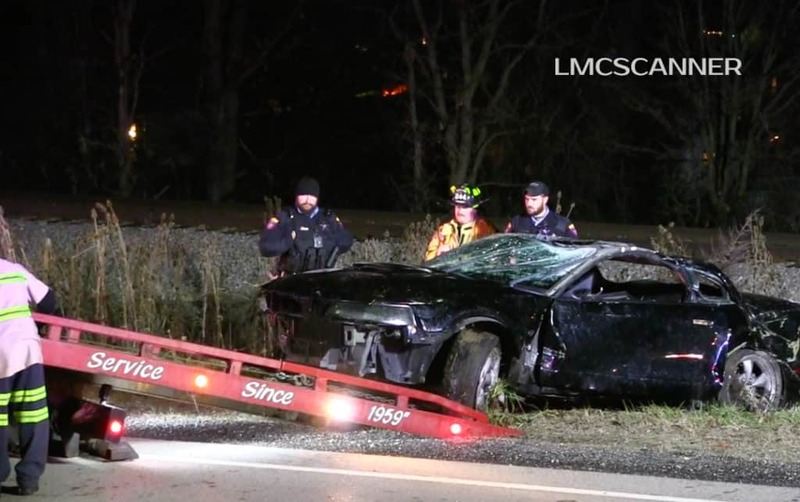 Christopher Covelli said that a 2002 Ford Mustang, driven by a 38-year-old man from Wauconda, was driving westbound when he illegally overtook another vehicle. The Mustang lost control and left the roadway before rolling over and striking the railroad tracks. Emergency crews found the car on the north side of the roadway just west of Harrison Avenue. The car came to a rest just off the tracks in the gravel that supports the train tracks. The man was transported with non-life-threatening injuries to Advocate Condell Medical Center. Nobody else was in the car or injured during the crash. Metra trains were halted and delayed. Engineers were called to help repair the train tracks which were damaged after the car landed on them. Covelli said that the investigation is ongoing and citations are expected to be issued. Route 134 was closed from Fairfield Road to Hart Road for almost two hours, causing extensive traffic delays in the area.